"Brittany" is a gorgeous wavy unit that will have you looking effortlessly fabulous. If you adore the body-wave texture, this is the hair for you. She is a full lace unit that can be parted anywhere desired and put in high or low buns. "Brittany" comes in a natural 1B color but can be colored/bleached as preferred. This 613 wig has dark root in a 1B color. All of our hair can be recolored if desired. The density of this wig is 100%. "Bombshell" is a silky straight unit that can be parted anywhere. 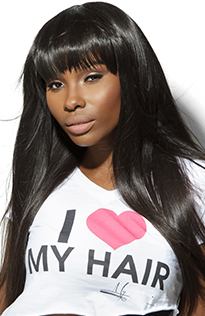 All of our units come in one size but comes with combs & sizers to customize each wig to your liking. "Bombshell" is truly a beauty! "Sapphire" is a straight unit. Picture shows unit curled. All of our wigs are pre-plucked and can easily be dyed/bleached. All the lace is a natural brown tone but can be bleached as desired. When plucking your frontals be very gentle to not harm the lace. She Brand has the finest quality for the most natural look and feel, so thank us later!